Bat country. Image designed by Gwen Fisher, engineered by Paul Brown. © Gwen Fisher. These lucky people are climbing around a 22 feet (6.7 metres) tall structure composed of 384 softball bats, 130 soft balls and a couple of thousand pounds of steel. 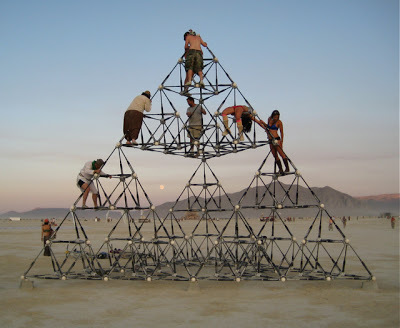 The structure represents a Sierpinski tetrahedron: a fractal which has finite volume but infinite area. The image only shows an approximation of the fractal of course, as it would be impossible to make a full-on Sierpinski tetrahedon with its infinite intricacy, but it's beautiful anyway! The picture, designed by Gwen Fisher and engineered by Paul Brown, is one of the images that appears in the book 50 visions of mathematics, which celebrates the 50th anniversary of the Institute of Mathematics and its Applications. 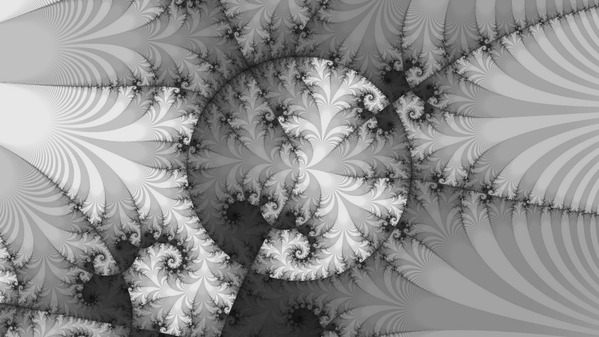 You can find out more about fractals here. What holds up the Forth Bridge? IMage courtesy of the Department of Civil and Environmental Engineering, Imperial College London. This is one of friend of Plus Ahmer Wadee's favourites images from the book 50 visions of mathematics. It is of a demonstration at Imperial College in 1887 of the mathematical principles behind (or should that be underneath?) the Forth Bridge. The bridge was the largest spanning bridge in the world at the time and the technique behind it was an innovation, essentially balancing the forces involved using cantilevers. 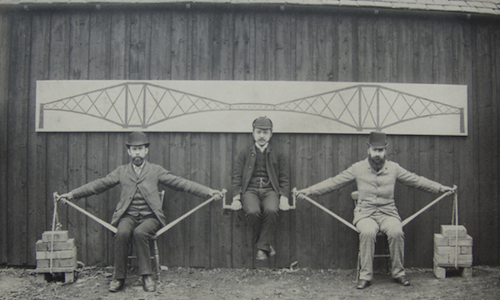 The men on the chairs (Sir John Fowler and Benjamin Baker) represent the piers of the bridge and the load on the bridge, in this case Kaichi Watanabe, one of the first Japanese engineers to study in the UK, is supported by the tension (in the men's arms and in the ropes to the anchors) and compression in the structure. So, what holds up the Forth Bridge? Why, maths of course! If you love physics and making movies then this is for you. The Foundational Questions Institute (FQXi) is excited to present Show me the physics!, its first-ever video contest. Anyone can submit a video conveying the joys of physics to win a top prize of $10,000, and there are very attractive runner-up prizes too. Fictional stories in which real physics plays a central role. The closing date is August 8, 2014. See here here for rules and submission guidelines and here to see the current entries. FQXi are our partners on the Information about information and Science fiction, science fact projects. Image by Lasse Rempe-Gillen – click on the image to see a larger version. To mark Germany's historic win over Brazil in the World Cup semifinal this week, Lasse Rempe-Gillen (from the University of Liverpool) created this beautiful image. It shows the behaviour of a model that describes the phenomenon of phase-locking, something that can be seen in the synchronising flashes of fireflies or when a roaring stadium of football supporters gradually clap or stamp in unison. The image is related to recent research and you can read more in our news story Maths, metronomes and fireflies. The grey parts of the image show where the model behaves chaotically – here even small changes in where you start can cause drastically different results in the model. The coloured parts of the image show where the model behaves in a more regular fashion where small differences won't dramatically change the results. This is because the model has attractors, special sets of conditions that create similar behaviour, either settling on a single outcome (called a fixed point) or running through a predictable cycle of outcomes. And in honour of the historic 7-1 score from the match, Rempe-Gillen's image has attractors of period 7 (with a repeating cycle of 7 points) and period 1 (a fixed point). In contrast his image below has no periodic attractors, symbolising the other, goalless, semifinal between Argentina and Holland. 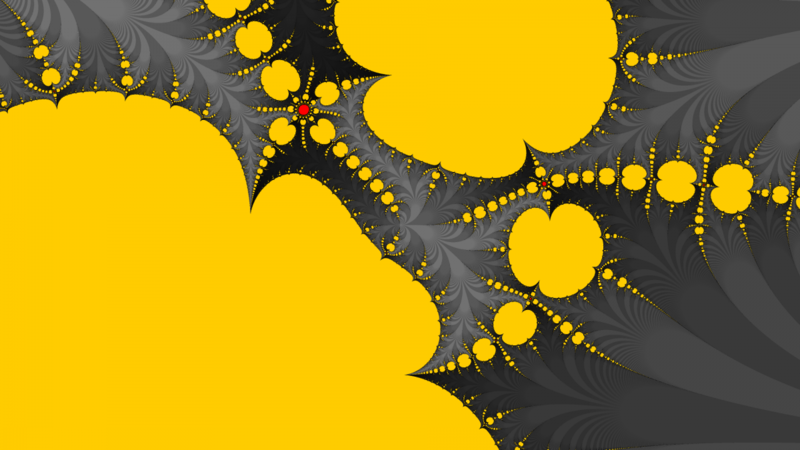 You can read more about chaos, fractals and football on Plus! Pedaler en grand braquet – Tour de France zooms through Cambridge! No theorems were solved at the Centre of Mathematical Sciences, home of Plus yesterday… Instead everyone was enjoying the Tour de France zooming through Cambridge! Whether it's finding the right gear, attacking the turns or building the perfect track, maths and cycling go together like lycra and shorts! Gearing up for gold – how the invention of the chain drive and some simple ratios can give you speed on the flat and power up the hill. Leaning into 2012 – why leaning into turns lets you go faster. How the velodrome found its form – how maths helped create the iconic curves around this ribbon of track. 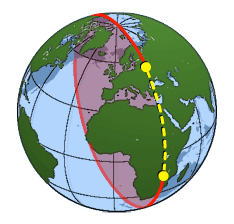 The dotted yellow line is an arc of a great circle. It gives the shortest distance between the two yellow points. Image courtesy USGS. The term "haversine" apparently comes from "half versed sine". To see why this function is useful, put yourself in the shoes of an intrepid traveller setting out on a sea voyage from Liverpool to New York. The first thing you'd want to know is how far you will have to travel. Ignoring islands, rocks, currents and other inconvenient factors, let's say that you will travel along the shortest path between the two cities. We know that the shortest path between two points is along a straight line, but that fact doesn't help you here. The straight line that connects Liverpool and New York cuts right through the Earth and you are not about to dig a tunnel. You need the shortest path on the surface of the Earth, which is roughly spherical. On a sphere the shortest path between two points is along an arc of a great circle: that's a circle drawn on the surface of the sphere which is centred on the same point as the sphere and has the same radius. Any two points lie on a unique great circle, which they divide up into two arcs. The shortest path between the points is along the shorter of these two arcs. (where the angles are measured in radians). You’ll admit that this isn’t the simplest of formulae. If you were are a seafarer hundreds of years ago, armed only with sine and cosine tables to help you, working out the distance would prove pretty cumbersome. There’s a square root to take, as well as the inverse of the sine function .... argh! Working out the great circle distance between two points is so important in navigation that people in the old days produced tables giving the values of the haversine function and also of the inverse of the haversine function. This made seafarers’ lives a lot easier. Working out the distance only involved looking up two cosine values and two haversine values, adding and multiplying them in the correct way, looking up the inverse of the haversine function and multiplying by — done! The reason why the haversine function has come out of fashion is that with the help of calculators and computers it’s easy enough to work out the distance straight from formula (2). That’s why you don’t find a haversine button on your average calculator. Let’s give it a go. Liverpool has latitude and longitude , and New York has latitude and longitude . These are measured in degrees. Converting them into radians (multiplying by ) gives and for Liverpool, and and for New York (rounded to three decimal places) Plugging these into expression (2), with the radius of the Earth , gives a great circle distance of around 5313 km. Quite a way to go!